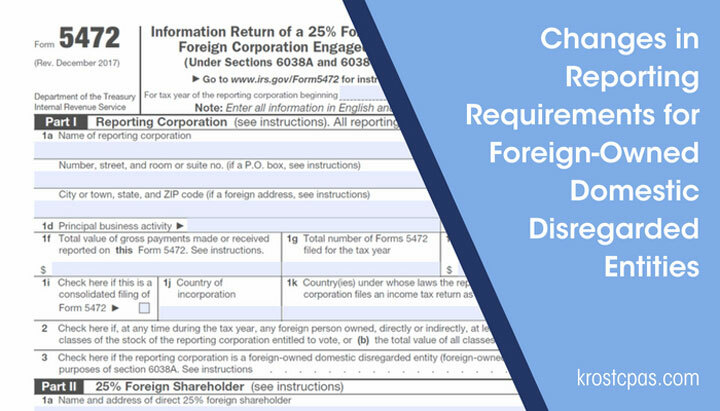 Foreign-owned domestic disregarded entities have not had filing requirements in the past unless an election was made to treat is as a corporation, known as “check the box”. Disregarded entities are most commonly single member LLC (SMLLC). Generally, income tax and reporting requirements would not be reported separately. Rather, they would have been reportable on the owner’s US tax return. This all changed when the IRS issued T.D 9796 on December 13, 2016. Under the new regulations, most disregarded entities will need to get an EIN and will also need to file Form 5472, Information Return of a 25% Foreign-Owned US Corporation or a Foreign Corporation Engaged in a US Trade or Business. The IRS is now treating these types of entities as domestic corporations as opposed to disregarded entities. The new rules are effective for tax years beginning after January 1st, 2017 and ending on or after December 13, 2017. Different from disregarded entities, domestic corporations have an annual tax return filing requirement. This is now required of any domestic corporation with a foreign owner whose interest is greater than 25%. These foreign-owned corporations will be required to report on “reportable transactions” with related parties. Some examples of reportable transactions are transactions relating to loans, commissions, sales, rents, royalties, etc. between the domestic corporation and its owner. Additionally, the exceptions available to other entities under Regs. Sec. 1.6038A-1(h) are not available to foreign-owned disregarded entities. These exceptions remove record keeping requirements for small corporations with less than $10 million in US gross receipts. Reg. Sec. 1.6038A-1(i) offers a safe-harbor for reporting related-party transactions if the transaction is less than $5 million and less than 10% of US income. This safe-harbor is also not available for foreign-owned disregarded entities. The penalty for not filing Form 5472 or filing an inaccurate Form 5472, is $10,000 per filing per year. These new regulations are intended to increase transparency, giving the IRS the ability to access pertinent information. These regulations will provide the IRS with the information it needs to comply with information exchange agreements and tax treaties with other countries. For more information or if you have any additional questions on the new regulations, reach out to KROST today.